A perfect gift idea for your mom, dad, sister, brother, grandma, wife, husband and other beloved ones with thousands of designs. You can find a theme for everybody and any interest in our iPrint Amazon Collection. 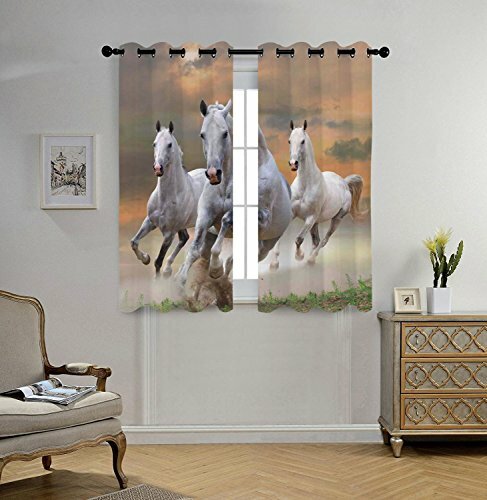 Size:84W x 63L Inch.Measurements are the total of the 2 curtain panels together.Perfect size for most living rooms & bedrooms & kitchen Cafe.Available in twelve different size options (55x39 Inch,55x45 Inch,84x63 Inch,84x84 Inch,84x95 Inch,108x63 Inch,108x72 Inch,108x84 Inch,108x90 Inch,108x95 Inch,108x108 Inch,120x66 Inch). These curtains are silky, soft, drapery and very pleasant to touch. Matches perfectly your windows, provides utmost privacy. These amazing curtains are sold in 2 panels per package.Includes: 1x plastic bag + 2x curtain panels.Not Included: curtain rod or other hardware.